Three Explosive Movies! Get ready for non-stop action, edge-of-your-seat suspense and spectacular chase sequences with everyone's favorite assassin in The Bourne Trilogy! Matt Damon is Jason Bourne, an elite government agent determined to outwit and outmaneuver anyone who stands in the way of his finding out the secrets of his mysterious past. Follow his explosive, action-packed adventures in three blockbuster films from one of the most popular series of all time: The Bourne Identity, The Bourne Supremacy and The Bourne Ultimatum. 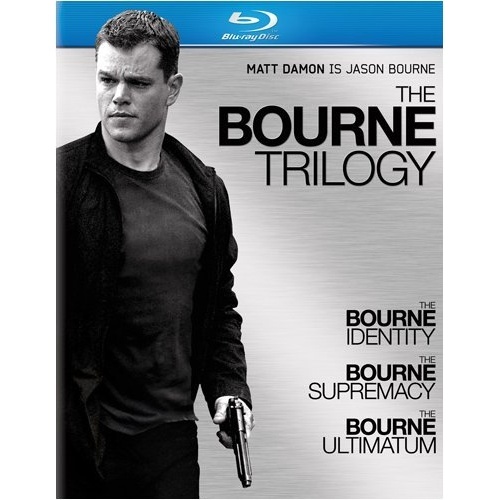 Loaded with hours of bonus features, The Bourne Trilogy is the complete Bourne experience for movie fans everywhere! The Bourne Identity Academy Award Winner Matt Damon stars in this explosive, action-packed hit filled with incredible fight sequences. Found with two bullets in his back, Jason Bourne discovers he has the skills of a very dangerous man and no memory of his violent past. Racing to unlock the secret of his own identity, he discovers the deadly truth: he's an elite government agent, a $30 million weapon the government no longer trusts. Now this top operative is the government's number one target in this super-charged, thrill-a-minute spectacular loaded with "Non-stop action!" (Bill Zwecker, FOX-TV) The Bourne Supremacy They should have left him alone. Academy Award winner Matt Damon is back as expert assassin Jason Bourne in this stunning, non-stop action hit. Fuelled by awesome fight scenes and some of the most breathtaking chase sequences ever filmed, it's a state-of-the-art espionage thriller that explodes into action and never lets up! The Bourne Ultimatum Matt Damon returns as highly trained assassin Jason Bourne, who is on the hunt for the agents who stole his memory and true identity. With a new generation of skilled CIA operatives tracking his every move, Bourne is in a non-stop race around the globe as he finally learns the truth behind his mysterious past. Loaded with incredible fight and chase sequences, it's the exhilarating movie with "mind-blowing action" (Roger Ebert, Chicago Sun-Times) that you can't afford to miss!